TWRA Officer Barry Baird demonstrates the correct use of a bright white light from a kayak while paddling near the Woltever Creek boat ramp at dusk on Harrison Bay on Friday, June 30, 2017, in Harrison, Tenn. The law requires paddlers to keep a source of bright white light (not red or green) and a life jacket on their vessels for safety. POLL: Have you gone paddleboarding or kayaking on the Tennessee River? Paddle sports, including canoeing, kayaking and stand-up paddleboarding, are growing, and so are the dangers when enthusiasts cross paths with motorboats and river currents. In 2016, four people were killed in Tennessee waters while paddling, according to the Tennessee Wildlife Resources Agency, and officials are hoping to raise awareness to prevent more. In 2015, a woman died near the 21st Century Waterfront when she fell from her paddleboard and was swept under a construction barge. TWRA officials said she was not wearing a flotation device. Many boaters believe it just won't happen to them or they can reach their life jacket if their vessel overturns, TWRA officials said. "The majority of deaths in Tennessee could have been avoided if boaters were wearing a life vest," TWRA officer Dustin Buttram said. "The hardest part of our job is seeing family members grieve over something avoidable." Agency officials say infrequent or new paddle-craft users typically don't see themselves as captaining a vessel or think they need to understand boating safety and state laws. Paddle-craft operators are exempt from a law that requires, motorboat operators born after Jan. 1, 1989, to complete a boating safety course. But officials say knowing the law is vital for safety, because powered vessels can overtake a slow-moving paddler and dangerous high water or winds can pose a threat in an instant. Kat Olinger, manager of L2 Outside, short for Live Life Outside, specializes in renting paddle craft, mostly stand-up paddleboards, to rookies and first-timers. One of several Chattanooga-area paddle craft rental companies, L2 is a block away from the Tennessee River on Market Street. Olinger said stand-up paddling, like other new sports, has evolved from an activity aimed at older folks to a leisure pastime and now a racing competition. And Chattanooga has become home to events such as ChattaJack 31, a 31-mile race through the Tennessee River Gorge in October, and a weekly informal paddle craft race that happens under the Market Street Bridge. "Definitely, it is an ever-growing sport for sure," Olinger said Friday. Stand-up paddleboards are the most popular craft people rent these days, she said, and "a lot of them are first-timers. They've never done it a day in their lives. Everyone's kayaked, everyone's canoed." All renters get some instruction on the craft, she said, and weather and river currents are an important factor to consider, too. A common mistake is taking off downstream first and then having to fight the current to return to the launch site, she said. "When we do rentals, we give everybody the lowdown on safety — what to do when a boat comes by, what to do when a wave is coming, what to do with other people on the water," she said. "And we won't send out people, of course, when the current is too strong or the winds are too high." Rental companies like L2 provide instruction and life vests and other safety equipment, and most require renters to sign waivers. "[They] do a great job informing paddlers," TWRA officer Barry Baird said. "It's that paddle-craft users don't always recognize the importance of safety and laws. It's disturbing to see people at risk and unprepared." Ocoee Adventure Center in Ducktown, Tenn., sees more experienced and hard-core paddlers than rookies and first- timers. While it doesn't rent equipment, the company provides instruction and guided tours for people who want to venture out on calmer water or whitewater in and around the Cherokee National Forest. "Stand-up paddleboards have just taken off," owner Larry Mashburn said. "It' really exploding." The whole industry is increasing in popularity, Mashburn said, but that growth is teamed with growth of access to public waterways. He figures that means the business is growing, but it's spread out across more and more businesses jumping in and making a splash. Mashburn said his business on the upper end of the Ocoee River operates mostly on the river, Ocoee Lake and the lesser-known Ocoee Lake No. 3. Mashburn said inexperienced guests are given basic safety instruction, tips and techniques needed for the particular watercraft they brought along. And state officials are out there, too. Baird and Buttram have stopped many paddle-craft operators to remind them about state laws. A typical violation is having improper lighting at night. 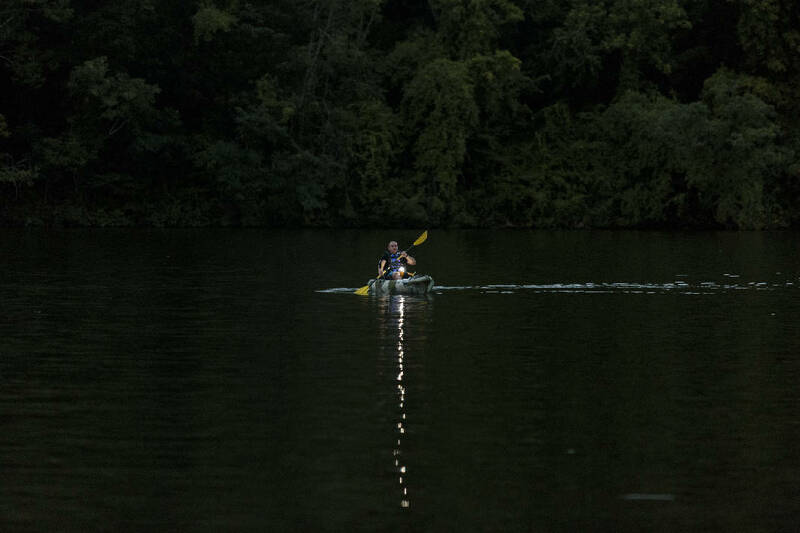 TWRA officers even held a demonstration of paddle-craft lighting Friday night at Ross's Landing. When it comes to safety in low- visibility conditions, more is better when lives are on the line. State law requires all paddle craft to exhibit a white light or lantern after sunset or during times of restricted visibility. "Go above and beyond with lighting. It will keep you safe. Even when you're compliant, do more," Buttram said. "Colors mean something on the water. They are a form of communication. Paddle crafts must have a white light and no other color," Baird said. And it needs to be visible all around, he said. "Many [paddlers] just simply wear a headlamp, and this is just not sufficient for other watercraft traveling at a higher rate of speed to see from behind." "There's a lot of free information out there on boating safety. Check TVA's water levels, flow rates and dam generation schedules before heading out," Buttram said. Human-powered vessels such as canoes, kayaks and stand-up paddleboards fall under state law. • An approved, wearable life jacket for each person must be readily accessible. Throw cushions do not meet this requirement. Life jacket(s) must be on board, not attached by a line or leash. • Children under 13 years old must wear life jackets while underway. Drifting is considered underway. • All paddle craft must be able to exhibit a white light or lantern after sunset or during times of restricted visibility. • Boaters’ state registration cards must be on board if boat is propelled by motor or a trolling motor. • A fishing license is required for anyone age 13 or older assisting or attempting to take fish. • It is unlawful to throw or sink litter from a boat.If a boat turns over, all contents must be retrieved. • It is unlawful to use or possess drugs or controlled substances while boating or paddling. • Persons under age 21 may not use or possess alcohol. • No person shall interfere with the safe operation of any motorboat or vessel. • All boats are subject to inspection. • All navigation rules apply. • Keep a proper lookout at all times. • Inflatable belt-pack life jackets need to be worn with the device in front of the body. • Inflatable life jackets are not approved for anyone under age 16. • Do not overload your boat. • Other rules, regulations, and laws may apply — be sure to check. All those incidents occurred on the Ocoee River in Polk County.